This is one of two panels in the museum's collections (Museum nos. C.71 & 72-1930) which were originally from the north window of the choir of Wallfahrtskirche in Strassengel, near Graz in Austria. Graz is the capital city of the Austrian state of Styria. 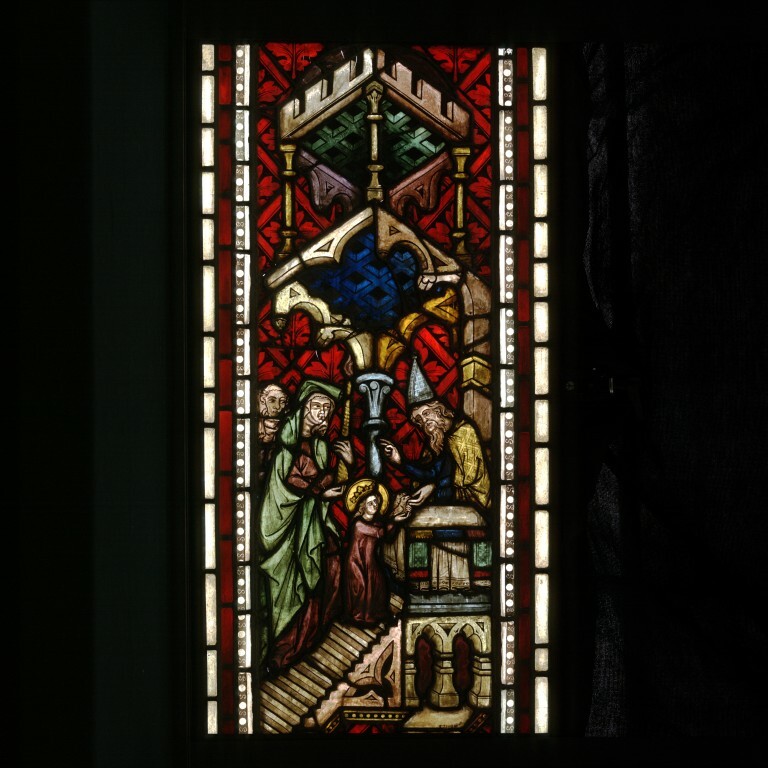 The panels formed part of a series of windows depicting episodes from the Life of the Virgin Mary. The church was consecrated in 1353 and it is believed that this series of windows dates from that time. The Wallfahrtskirche was restored in 1885 and it was probably at this time that some of the choir windows illustrating the Life of the Virgin Mary were removed. The Life of the Virgin Mary was a popular subject in medieval devotion. It was illustrated in manuscripts, frescoes, panel paintings, sculpture, textiles and, as here, in stained glass. Very little of Mary's life is recorded in the Canonical Gospels of Saints Matthew, Mark, Luke and John. Other sources such as popular saints' lives were consulted. One of the most influential collections of saints' lives was the 'Golden Legend' which was compiled in the middle of the 13th century. This text, reproduced many times in the late medieval period, had an enormous effect on the artistic works of the medieval church. The original sources that the compiler of the 'Golden Legend' used for the life of Mary were what are now called the 'Apocryphal Gospels'. These are texts written in the early centuries of the Christian era that were considered to be non-authoritative and were excluded from the canon that formed the first Bible. This panel depicts St. Anne bringing the young Mary to the high priest at the temple. The doves that Mary carries are the offerings made to the temple. This story is an obvious parallel to that of the canonical story of the Presentation of Jesus in the Temple. The elderly St Anne, accompanied by a female companion, appears on the left of the panel. She carries a long lighted candle and is ascending a set of stairs with the young Mary. At the top of the stairs is an altar with the high priest standing behind it. Mary reaches out towards him and presents him with two birds, presumably doves. The high priest reaches out to take the birds. The whole scene is located under an elaborate double-canopied baldequin, executed in perspective. The background is composed of a diaper of stylised oak leaves within diamond-shaped vesicles. These two panels were originally from the north window of the choir of Wallfahrtskirche (Marian pilgrimage church) in Strassengel, near Graz in Austria. Graz is the capital city of the Austrian state of Styria. The panels formed part of a series of windows depicting episodes from the life of the Virgin Mary. The church was consecrated in 1353 and it is believed that this series of windows dates from that time. They are similar in style to windows in St. Stephen's Church in Vienna which were created between 1340 and 1350 and are associated with the work of the 'Master of Hohenfurth', a Bohemian painter active in the middle of the 14th century. They were still in situ in 1858 when they were recorded in a government report. It is assumed that they were removed from the church during restoration work in 1885. They were acquired by the Museum with assistance from the National Art Collections Fund in 1930. Two other panels from this series of the Life of the Virgin Mary are in the Kuntsgewerbemuseum in Vienna and others are in the Joanneum in Graz (apparently), the Metropolitan Museum in New York, and in Kiev. Panel of clear, coloured and flashed glass painted with brown/black pigment. Depicting the Presentation of Mary in the Temple. Originally from the Wallfahrtskirche (Marian pilgrimage church) in Strassengel. Made in Austria (Styria), about 1350-1355.